So, I am on my way to becoming a certified crazy cat lady, just need to acquire a few more cats and get rid of the husband. 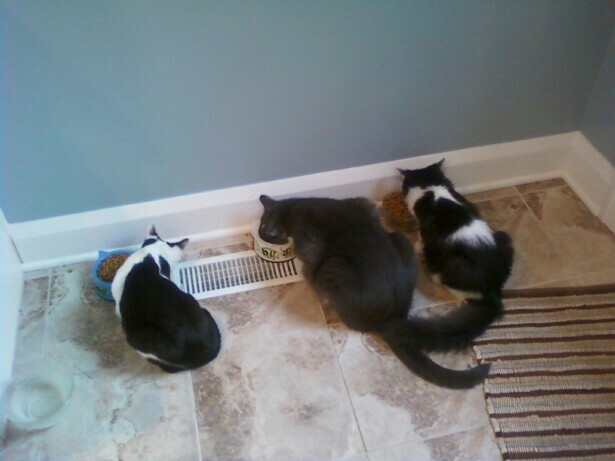 Our home is the current residence to 3 male cats, which we lovingly refer to as the feline Russian mafia. We have Vladimir, the czar, and his minions, Vitali and Niko. Like any regime, there is always rebellion, but more on their physical activity, uh battles, in the future. For now, I want to speak to their eating behaviors. There are some things that humans can learn from my feline friends. Some of you that know my beloved pals probably are thinking “what the bleep can we learn from these slightly rotund cats?” Vladimir tops the scales at 16lbs, and the less than a year old minions weigh in at 11.5lbs for Niko and 10lbs for Vitali. But, remember, they were all adopted, which means that I am unfamiliar with their ancestry; they may have been bred from mountain lions for all we know. And, just like humans, cats come in all shapes, colors, and sizes. I am not in any way inferring that we should abide by all cat eating behaviors. I do not recommend eating the same thing day after day. Humans’ nutritional needs are much different from those of cats and we require a much more varied diet. And, I don’t recommend playing with ones food or eating on the floor; both behaviors will get you thrown out of any decent restaurant. First, I want to address Vladimir’s weight and how much his behavior parallels that of humans. His veterinarian informed me that Vladimir was a bit on the heavy side, which totally humiliated him, and that he would benefit from going on a “diet.” Being a dietitian, I know about human diets, but not so much about putting cats on diets. So, I went out and did what most humans would do if they were told to lose weight, buy “diet” food. What’s funny is, that just like humans, Vladimir just ate more diet food, thus, eating just as many calories as he did with his previous non-diet tidbits and probably even eating more because he wasn’t satisfied with this crappy tasting substitute. Think Wow chips, Snackwell’s, sugar-free desserts, etc. News Alert: diet foods don’t work, and they don’t taste good! Okay, back to the original story of why I think humans have something to be learned from cats. Cats eat when they are hungry and stop when they are satisfied. They don’t typically overeat, unless given diet food or put on a restricted diet, and then binge later when they get a hold of the leftovers….just like humans. They don’t eat when they are bored or when doing their favorite activity, which is licking themselves or sleeping. They don’t eat as fast as they can, and thus overeat, because they have to get back to chasing each other or staring at the birds. They actually chew their food. I have never seen any of my cats put food in their mouth, run over to the water and swallow it whole, which is a behavior that I myself have done and have witnessed many a humanoid doing as well. Cats actually listen to those small brains of theirs for signals of hunger and satiety. We have bigger and more advanced brains than cats, yet many of our species insist on using only a fraction of it. 1. Eat only when you are hungry. Don’t eat because you are bored, stressed, or because you are accustomed to eating when watching TV or other activity, etc. 2. Chew and actually taste your food, eat slowly. Stop swallowing your food whole with water. 4. Stop when you are 70-80% full. If you have to unbutton your pants after a meal, you’ve eaten too much. 5. Eat real food. Get rid of the tasteless diet foods; you’ll just end up eating more.